File this one to horrible, a mother stands accused and her boyfriend has been convicted of manslaughter for beating her four year old child to death. 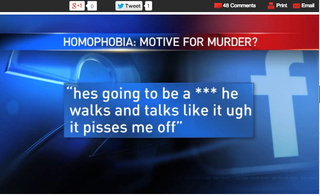 The motive appears to be because the child was perceived to be gay. Prosecutors argue the mother, Jessica Dutro-Bogess, had a long history of physically and verbally abusing the child because of her perceptions of his sexuality, including his manner of speaking and walking. A search warrant included Dutro-Bogess' internet presence. A message on Facebook in May 2012 shows her calling her four year old son, Zachary a "fag:"
hes going to be a fag he walks and talks like it ugh it pisses me off. The boyfriend, Brian Canady, has been convicted of the actual death. Court documents say Canady got into an argument with another resident in August of 2012 and then took out his anger on the child when the boy didn't listen to orders to sit in front of the television.